In general, determining the pitch of an existing roof is a simple calculation. This can be accomplished by measuring the number of inches the roof rises vertically for every 12 inches it extends horizontally. For example, a roof with a 6-inch-12 pitch is one where it rises 6 inches vertically for every 12 inches of the horizontal run. However, when determining the pitch for a new roof, both climate and materials should be considered. If you are adding an addition to your home or installing skylights, knowing the existing pitch is important. You can safely measure the roof pitch from inside your attic with a level that is either 18 or 24 inches, a tape measure and a pencil. Begin by measuring 12 inches on your level and marking it with a pencil. Once in the attic, hold your level against the bottom of a roof rafter, ensuring that all bubbles are resting in the center. 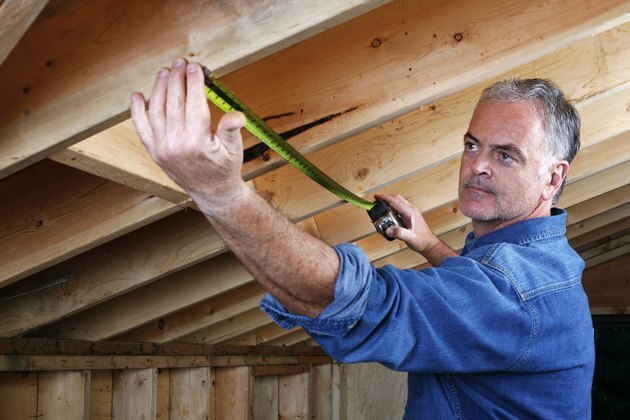 When properly in place, locate your pencil mark and vertically measure up to the underside of the rafter. You have now determined the number of inches your roof rises in 12 inches. A pitched roof works well in any climate and is the most common roofing style. The general temperature will determine the exact roof pitch, with a lower pitch being best for temperate zones and steeper for areas that experience snowfall. The most common roofing material is asphalt shingles. Asphalt is the most versatile and works well in any roof pitch climate. Metal is rising in popularity as recycled options have improved in quality and can be cheaper than purchasing tiles. However, if your area is prone to hail, avoid installing a metal roof as denting will occur. If you live in a climate with cold winters and numerous snow storms, a pitched roof will prevent the snow from remaining on the top of your home. The steeper the pitch, the better the snow will fall to the ground. Building a roof with wood shakes works well in moist, colder climates as they don't dry out from the snow. Slate is also a popular material in this climate zone. And although asphalt shingles are the easiest to damage among the roofing materials, they are another good option for snow, as long as your climate isn't too windy. Metal is another material that will work in winter weather, and it boasts better durability and lifespan than asphalt shingles. Dry, warm climates, located in Arizona, Nevada and southern California, often feature flat roofs. However, due to the risk of thermal shock – the result of rain on a very hot roof – it is important to consider your materials carefully. Thermal shock will cause the roof to contract quickly as the rain cools it down, creating cracks because the top of the roof shrinks faster than the bottom is able. There are two common materials used to build a flat roof in this climate. The most popular is Thermoplastic polyolefin (TPO) because it's not easily damaged in the dry heat. The other is spray polyurethane foam with elastomeric coatings as it's seamless and covered by a reflective elastomeric coating, reducing the risk of thermal shock. Pitched roofs are also used in dry, warm climates. Slate and tile are the preferred materials for a pitched roof in these areas because they can absorb heat while keeping the home's interior cool.